Provide comfort for the family of Bessie Getchell with a meaningful gesture of sympathy. 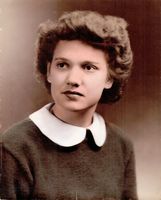 Bessie Schoppe (Cole) Getchell, 92, passed away peacefully surrounded by family on March 11, 2019 at 9:45 a.m. She was born to Neil and Martha Cole in South Thomaston, Maine on August 22, 1926. Bessie was the second eldest of nine children: Phillip, Bessie, Donald, Jean, Dorothy, Neil, Virginia, Kenneth and Alan. To know Bessie was to love her. Bess was a wonderful cook. Cooking you a big meal was one of the many ways she showed her love. She loved the holidays and tradition. Bessie loved to dance and she loved the ocean. She often would say, “I need to smell the salt air.” Bessie loved many things, but most of all she loved her family and the very best of times for her were spent with her family around her. Bess leaves behind her son, Clinton N. Getchell and daughter-in-law, Joyce her daughter, Brenda J. Vanelli and husband Bob her son, Steven R. Getchell and life partner, Bert Johnson; grandchildren Heidi and Jonas, Clinton Jr. and Kath, Kala and Jack, Angela and Keith, Zane II “Willy” and Kelli; great grandchildren, Benjamin, Brittany, Kirsti, Dillion, Taylor, Connor, Hannah, Holly, Paige and great great- grandson, Andrew; sisters , Jean, Dorothy, Virginia and brother Alan; many nieces and nephews. Provide comfort for the family of Bessie C. Getchell (Cole) by sending flowers.